We are located on the Village Square, in the centre of Blarney, County Cork, directly across the road from Blarney Woollen Mills & Blarney Castle. There is a daily / hourly bus service from The Bus Station, Cork City directly to Blarney and it stops just outside our door! Cork International Airport services the southwest of Ireland and is the closest airport to Blarney. Both Ryanair and Aer Lingus fly in and out of Cork Airport. Bus Eireann The National bus company in Ireland provides local bus services, Expressway long distance intercity services, Eurolines services with destinations in Britain and Europe. Use the site to learn more about the fares and the services they offer. There is a daily / hourly bus service from The Bus Station, Cork City directly to Blarney and it stops just outside our door! From Dublin: Take the N8 towards Cork. At Cork, take the North Ring Road and follow the signs for Limerick (N20). From the N20 take the R617 into Blarney. From Limerick: Take the N20 towards Cork. Before Cork, take the R617 into Blarney. 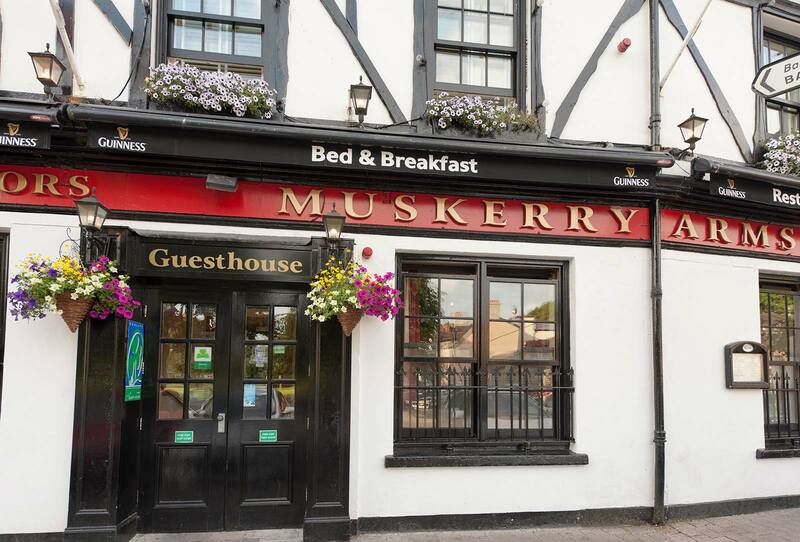 From Cork Airport by bus: To get to the Muskerry Arms from Cork airport you will have to take two buses. From Cork Airport, you can take the 226 to Parnell Place Bus Station, the main bus station for Cork city. From the bus station take the 215 to Blarney (Woollen Mills) (final destination will be marked as Cloghroe). The Blarney bus leaves every 30 minutes at five past and thirty-five past the hour. The bus stops just outside the Muskerry Arms.